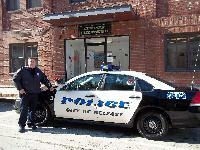 The Belfast Police Department is a full service police department serving the citizens and visitors of the City of Belfast. The officers strive to deliver police services in an innovative, professional and compassionate manner. We work hard to partner with the community to address its concerns and make this City a great place to live, work, and play.